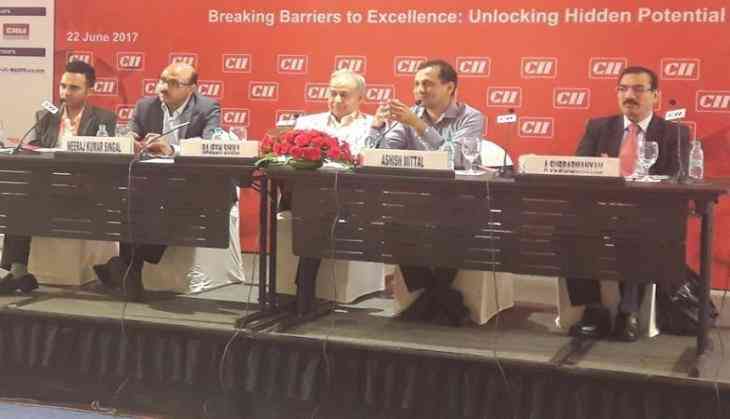 The CII MSME Summit titled, 'Breaking Barriers to Excellence: Unlocking Hidden Potential,' echoed the preparedness of MSMEs to adopt the GST regime. Alongside, the MSMEs seek support from the government for training and awareness programmes on how to implement it, which is critical for the growth of service sector that accounts for about 60 percent of India's GDP. "GST transition will accompany challenges as well as opportunities for MSMEs. We need to focus on the opportunities, which the sector can tap only with the government support", said Mr Jyoti Prakash Gadia, Managing Director, Resurgent India. With the Indian economy expected to emerge at USD 5 trillion by the next decade, there needs to be major emphasis given to what is the backbone of the economy, which is the MSME sector. Speaking on the technological solutions for GST compliance, Ashish Mittal, Co-Founder, EasemyGST, said, "The One Tax One Nation will be a game-changer for the entire economy, ensuring sustainable growth. The MSMEs require favourable ecosystem to realise the full potential of tax reforms translating into profitable proposition." Digitisation is the key to the progress of Indian economy, with reforms like GST and demonetisation. "Apart from the Government support, the bigger companies need to hand hold the smaller ones, so that the entire value chain understands the technological threads of GST compliance and everyone reaps business benefits. Many technological companies are already on job to strengthen the GST value chain through its various software solutions", said Mr Mittal. The summit also deliberated on challenges faced by the MSME community including the need for strengthening the credit access policies, technological transformation and support required around training and skilling. Other dignitaries present at the event included Anish Chaudhry, Chairman- CII Western Uttar Pradesh Zonal Council; Shreekant Somany, Chairman, CII National SME Council, Chairman, CII - Centre of Excellence for Competitiveness for SMEs; Mr. A. Subrahmanyam, Deputy General Manager, Export-Import Bank of India; Mr. Dharmendra Kalra, GEVP and Regional Business Leader -SME/Business Banking, Yes Bank.